This medical bracelet comes with BLACK pre-engraved, medical information, that is easy to see and read. Black engraving is highly recommended to increase visibility. Medical ID Card is included with all items. Buy professional Medical Jewelry & Engraving for your safety. 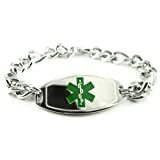 Our hypo-allergenic stainless steel medical jewelry is the best way to give critical health care information to emergency medical professionals to quickly determine the right treatment for you. First responders are trained to look for medical ID. With medical identification, they immediately know if you have a medical condition, life threatening allergies or if you require any critical medications. If you include emergency contact information, you can be sure that loved ones will be notified promptly. Each bracelet is engraved with the word ALZHEIMER'S. If you would like to have personal info or more medical info engraved (at no extra charge! ), just contact us after placing your Amazon order! You can reach us 24 hours a day at 1-800-439-8899 or send us a message through Amazon.com. Your bracelet will be 7.5" in length unless you specify otherwise. The bracelet plaque measures 1/2" wide by 2" long. We will mail it via USPS First Class Mail within 24-48 hours of order completion. These bracelets are so durable that we guarantee them for life. Your 7.5" bracelet comes engraved with the word: ALZHEIMER'S. If you would like personal info or more medical info engraved, or a different chain length (all for no extra charge! ), just contact us after placing your Amazon order! Alzheimer's Medical Bracelets come highly recommended by Doctors and Paramedics. These pieces of medical jewelry could save your life in a time of emergency. This medical bracelet comes with BLACK pre-engraved, medical information, that is easy to see and read. Black engraving is highly recommended to increase visibility. Medical ID Card is included with all items. Buy professional Medical Jewelry & Engraving for your safety.